After twenty years of marriage, and seventeen of those with kids, we have finally broken down and bought a dog for our fifteen year old daughter. Her name is Kiko and we adopted her from the Austin Animal Shelter. 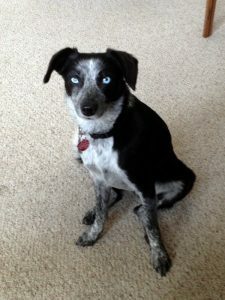 She is seventeen months old, a cross between a Border Collie, Australian Cattle Dog, and something small since she is fully grown and weighs just 19lbs. Kiko is an amazing dog. She does her business outside, sits when you ask her, walks by your side, plays fetch until she falls down exhausted, and is always by my daughters side (I wish Kentucky was this well trained). Having her in the household has been far less stressful than I expected and just like The Drinking Man’s Diary she has eased my pain.